For Overhead lifting requirements, we provide hand operated traveling cranes that come in both single and double girder models. Single Girder I Beam type Overhead Crane is used in the application of lifting the heavy loads which may weigh up to 10 T and also for transporting such heavy weights including the span of 30m and more than that. This Single Girder I Beam type Overhead Crane is compatible with wide pans and heavy weights. 2 torsion free box grinders, EOT Girder Cranes handling material, travelling EOT Cranes can withstand heavy loads. So, these double EOT Cranes are useful in lifting heavy loads that cannot be done by normal cranes. In addition to this, we manufacture various kinds of HOT cranes that includes Double Girder HOT cranes, under slung cranes, etc. Different class level cranes are also manufactured upon customized request by customer. Class I: These are light duty, low maintenance cranes. 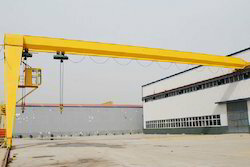 Class II: These are medium duty cranes that are used mainly in processing lands, workshops, warehouses etc. Class III: These are heavy duty cranes used in production shops. Class IV: These are extra heavy duty cranes having application in steel industry, storage houses etc. Double Girder Box type Overhead Crane is used in the application of lifting the heavy loads which may weigh up to 10 T and also for transporting such heavy weights including the span of 30m and more than that. This Double Girder Box type Overhead Crane is compatible with wide pans and heavy weights. 2 torsion free box grinders, EOT Girder Cranes handling material, travelling EOT Cranes can withstand heavy loads. So, these double EOT Cranes are useful in lifting heavy loads that cannot be done by normal cranes. We are the leading manufacturers of Single Girder Box type Overhead Crane. EOT (Electronic overhead travelling) crane is essential industrial equipment involved in material handling job. Single Girder Box type Overhead Crane are used to lift the objects by a hoist fitted in a trolley.It comes under standard crane types. Overhead cranes can be segregated under two categories based on the number of cross –girders and based on the nature of running. We provide Crane that is also known as transfer cranes and are used to transfer loads form one bay to another.This type of load movement is not possible with the conventional top running cranes. Transferring the loads directly from crane to crane or by fixed transfer sections, these cranes are appreciated for optimum lifting capacity. We are a well established manufacturer and exporter of Double Girder I Beam type Overhead Crane, that find application for the purpose of lifting & transporting the loads over 10 T and for span of more than 30 m. Comprising of 2 torsion-free box girders, these EOT cranes such as double girder EOT cranes, traveling EOT cranes, material handling EOT cranes etc., are compatible, when heavy loads and wide spans are required.